With a bit of time to play over Christmas I had a go at applying some of the techniques described at ProgrammingHistorian to the ADB Online. 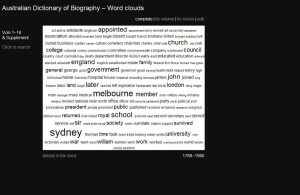 I thought it might be interesting to create some word clouds, both for what they could reveal about the content of the ADB, and to see what they had to offer as a way of improving access to the articles. So I set about learning Python and was soon downloading and scraping the more than 10,000 articles that make up the ADB online. Who’d have thought it? In a biographical dictionary? After further refining the stopwords list I started to generate some useful clouds. 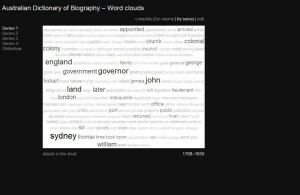 Finally after 147 minutes of processing time, I had a word cloud representing the content of all 16 volumes of the Australian Dictionary of Biography. 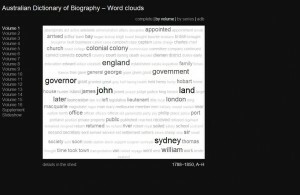 The words in the cloud are linked back to the ADB’s own search engine, allowing the cloud to be used as a way of exploring the articles themselves. It shows the top 200 words, but if you want to see the rest you can download the raw word frequency file (>1mb txt file). What can you see? Amongst other things, John is obviously the most popular name, Sydney just edges out Melbourne as the most popular place, and burial beats cremation as the most common mode of dispatch. It’s fun to explore. But of course this then set me wondering about how these frequencies might change with the development of the ADB and changes in its subjects. So I generated word clouds for each volume and for each chronological series. One of the most obvious features in the series clouds is the gradual disappearance of ‘land’. It’s one of the most prominent words in the first series, but gradually fades until it disappears completely in the last. After this successful foray into the world of word clouds, I began to think about other ways of visualising the ADB’s content. Many of the articles have portrait images, wouldn’t it be interesting to use the images themselves as the entry point to the biographical articles? I’d already been playing with CoolIris, so I decided to harvest all the portrait references and use them to create a 3D wall. The result is pretty spectacular. The worddict = dict.fromkeys(wordlist) line made all the difference, creating a list of unique words that could then be checked against the full word list. With this hack in place I was able to process a complete volume in a few minutes. The first two lines should be pretty obvious. As you can see, I originally excluded names of the capital cities, but then realised that you could watch Sydney and Melbourne battle it out for pre-eminence, so I excluded the exclusion. Also out were family relations and various other words that turned up in almost every article. Cleaning out all the non-alphabetical characters from the text had left a lot of orphaned letters that had once been things like £ signs, so I had to dispose of them as well. To display all the portrait images in CoolIris I had to harvest all the image details and then write them to a Media RSS file for CoolIris to read. Extracting the details of all the thumbnail versions of the portraits in the ADB was easy using Beautiful Soup. But I also need the paths to the larger versions of the portraits stored on the sites of the repositories that hold the originals. All of these sites present the images differently, so a different scraper was needed for each of them. As yet I’ve only included major libraries and archives – I may add some more if I get the time. if (i == 17): vol = "AS1"
repository = "State Library of NSW"
repository = "State Library of Victoria"
repository = "State Library of SA"
repository = "National Library of Australia"
repository = "National Archives of Australia"
repository = "Northern Territory Library"
repository = "State Library of Tasmania"
repository = "State Library of Queensland"